For those who wish to perform exercises using the app Tät®! The app Tät® is a CE-marked medical smartphone application for the treatment of stress incontinence. It was developed within the research project tät.nu at Umeå University with support from the unit for IT services and system development (ITS) at Umeå University. The app contains information, pelvic floor exercise programmes involving 6 basic steps and 6 advanced steps, a facility for creating reminders, and a statistical function. Treatment supported by the app produced positive results when assessed in a research study for women with leakage triggered by coughing, exercise (especially jumping) or physical activity. Nine out of ten women who performed exercises with the help of the app showed improvement, compared with two out of ten in the group which was still waiting to receive the app. You can download the Tät app via the App Store (iPhone) or Google Play (Android). To allow us to monitor what happens when the app becomes generally available, we would like you to answer questions about your age, gender, education, where you live (urban or rural), pregnancy and urinary leakage. Three months later you will be asked some follow-up questions about your urinary leakage and how often you have performed the exercises. Replies to the questions are entered anonymously on our research database; these replies cannot be linked to specific users or telephone numbers. The answering of questions is entirely voluntary. The study has been approved by the research ethics committee at Umeå (Ref. no. 2014-389-32M, Dnr 2017-405-32M). Personal Data means data about a living individual who can be identified from those data. We do not collect any Personal Data. The data we collect from questionnaires are anonymous and we do not have any possibility to trace the data back to a specific person. It is optional to respond to the questionnaires and the user can use the app without responding to the questionnaires. The responses to the questionnaires are not stored in the app. They are transferred to a secure database at Umeå university via SSL-encryption. We do not ask for and we do not store any information about name, id, e-mail, phone number, IMEI-code, IP-address etc. The App does not support sharing of information with other Apps, systems, organisations or users. The Tät® app for pelvic floor muscle exercises is now available in Swedish, Arabic, English, Finnish, German and Spanish. We continue to follow up usage and results using anonymous surveys in the app, more than 50,000 women have answered our surveys. Find out more about the study here. The Tät® app for pelvic floor muscle exercises can be downloaded at App Store and Google Play without cost. We continue to follow up usage and results using anonymous surveys in the app. Find out more about the app here and more about the study here. 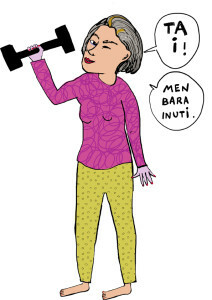 The Tät® app for pelvic floor muscle exercises is now available in Swedish, English and Finnish. As previously, we follow up usage and results using surveys in the app, and so far 40,000 women have answered our surveys. Find out more about the app here and more about the study here.